The top probate lawyers in Jacksonville can’t stress enough how important estate planning is to the lives of not only the client but also his or her loved ones and friends. Estate planning is done to ensure a person has access to long-term health care and is done to ensure the client can leave behind a legacy. This is why we offer a free Florida Probate consultation with clients where will discuss the following information. 1. 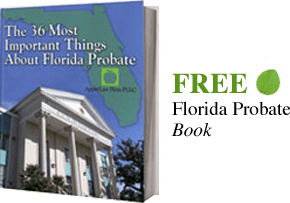 Why is Probate in Florida necessary? Probate is required in Florida to pass ownership of the decedent’s assets to his or her beneficiaries. If a decedent dies with a Will, the document must be submitted to the probate so the court can transfer the assets. If the person had no Will, then the estate must pass according to intestate succession. This means the decedent has no say in how his or her assets will pass, and only certain family members will receive a predetermined percentage of the estate according to Florida law. 2. What Assets Need to go Through Probate? Probate administration only applies to probate assets. Probate assets are assets the decedent owned his or her sole name at death. Probate assets are also assets the decedent and another co-owner owned, but the property lacked a provision that provided for automatic succession of ownership at death. For instance, a bank account in the name of the decedent is a probate asset. However, if a husband and wife, with rights of survivorship, hold the bank account, then the bank account is not a probate asset. The wife would become the sole owner of the bank account. 3. What are the Florida Probate Options That Make Sense for Me? There are two types of probate documents we often recommend to clients: the Will and the Trust. A Will is a document, signed by the decedent and two witnesses. A Will passes property from the decedent to his or her beneficiaries after death. The Will also designates a personal representative to administer the Will during probate. Probate is a lengthy process that can be quite expensive. Depending on the size of the estate, and if there are claims by beneficiaries or creditors, it can take years before court distributes the assets. This is why for some estate we recommend a living trust. A living trust is a revocable trust that allows the client to transfer property into the trust while he or she is alive. The client has full control over the trust, and can enjoy the trust’s assets in the same manner as if he or she owned the assets outright. The main benefit of a living trust is that the assets held by the trust avoid probate. This means the trustee can distribute the trust assets in a much quicker manner. 4. Do I Need Letters of Administration? Once a Will is admitted to probate the probate court will then declare a person or entity to serve as the personal administrator of the estate. Once the court names the personal representative, this person has to administer the estate according to certain rules. This person must identify and value the estate’s probate assets, and he or she must also publish a notice to creditors to allow beneficiaries to make potential claims. Further, the personal representative must also serve a notice of administration. This is a notice given to all of the qualified beneficiaries of the estate. This provides information about the estate such as the value of the assets. It also tells the beneficiaries the procedures they should pursue if they object to the administration of the estate. 5. The Timing of Filing a Probate in Florida, When Should I Start the Probate? Probate should be started as soon as possible because it can be such a long process. Before probate can begin someone must first file the decedent’s Will with the probate court. A person should file the Will with the clerk of the circuit court in the county in which the decedent lived at the time or his or her death. When you talk to an attorney in our office about a Probate in Florida, you will learn about the costs and options with each type of probate that applies to your specific situation. For a no obligation, no cost probate consultation call our us at (904) 685-1200 or use the Contact us form on this page. To have a more meaningful consultation, please complete the Probate Intake Form.